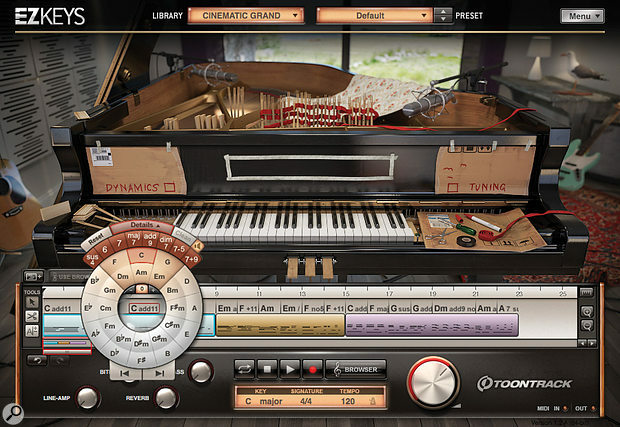 Even though an 1891 Bösendorfer grand piano was used to create all of Cinematic Grand's core samples, what Toontrack are presenting us with here is more a collection of atmospheric sound-design patches than a virtual Bösendorfer. Potential customers looking for an accurate acoustic piano emulations need not feel cheated, however, as the EZKeys range already includes Grand Piano and Studio Grand, as well as several upright piano emulations. In the creation of Cinematic Grand, sound designers Andreas Estensen and Mattias Eklund used four distinct methods of extracting sounds from the Bösendorfer, which they defined as Bowed, Plucked, Harmonic and Damped. Horsehair was used to bow the piano strings, but for the plucked category the duo simply used their fingers. To dampen the strings and enhance the piano's harmonics, a variety of unspecified materials were added. Having completed the recording of the four categories, the team combined them using differing ratios and applied effects and processing to create the 34 presets that comprise the final instrument. What's missing from the presets menu are the unprocessed Bowed, Plucked, Harmonic and Damped solo recordings, some of which Toontrack tantalisingly feature on their website. To some extent, the preset mixes can be stripped back using a panel of six editing knobs that are included in the Song Track section of the interface, but it's not possible to access the raw sounds directly. Some presets offer control over delay time and repeats, while others include a reverb attenuation dial. Common to all, however, are dials governing the levels of the Plucked, Bowed, Damped and Harmonic sounds that make up the preset, and it is with these that the user is able to create their own mix ratios. When editing is complete, the customised preset can be processed a little further, through the adjustment of the standard EZkeys dynamics and tuning parameters, which are found under a pair of virtual flaps on the piano graphic. Another standard EZkeys feature is the on-board sequencer in the Song Track section, which makes it possible to build compositions both by copying blocks of notes and by recording a performance. Ultimately, I prefer to do my sequencing in a DAW, but I find that the EZkeys sequencer is excellent for quickly testing out ideas and presets. As for the presets themselves, it is impressive how varied they are, given that a single piano was the source. Some mimic cellos, while other have an organ-like quality. There are a number of orchestral pads, some massive ambient delay soundscapes, and there are even ones that sound like pianos! To provide some examples, Windy Fields retains the key noise of a piano, but leads with an almost harpsichord-like pad layer, courtesy of horsehair‑bowed strings. Dark Celtic has a similar pad sound but with masses of reverb and none of the key noise. And Lonesome could almost stand in for the piano on the Rolling Stones' 'She's A Rainbow', if there was a way to reduce its reverb. In conclusion, Cinematic Grand provides something quite different to the other piano-based products in the EZkeys range, but still includes all the same easy-to-use tools that make the company's wares so attractive. Jobbing sound designers are almost certain to find this instrument extremely useful.